MX3 has been in the conference services business for over a decade. 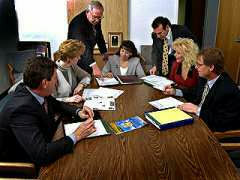 We take pride in our assertive approach of event management and planning. MX3 main attribute is being detailed oriented. Many people and business use this term "detailed oriented”, but MX3 understands its true meaning when it comes to the avenues of event planning. The first step to coordinating a successful event is asking questions. Understanding requirements and goals are the main fuel in order to fulfill a client's wishes and exceed any and all expectations. MX3 will be involved with site visits to ensure the client, venue, and MX3 have the same vision and expectations for the day of the event. MX3 provides diagrams with detailed quotes for clients to envision locations, functionality, and costs. MX3 Audio Visual will be a valuable asset for the success your next event.